I have seen all but one of the Code 1 species. The one I have missed is the Mexican Whip-poor-will. Until a couple of years ago, this species was not separated from the Whip-poor-will and I have seen quite a few Whip-poor-wills over the years, but never, to the best of my recollection, one of the southwestern race, C.v. Arizonae, which has now achieved separate species status under the name, “Mexican Whip-poor-will”. I suppose a trip to southeast Arizona will be on my itinerary soon, so that I can (once again) claim a sweep of the Code-1 species. 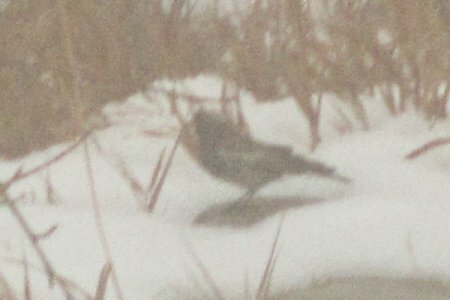 I found out about the Black Rosy-finches of Sandia Crest through the excellent website of approximately the same name. I have made previous efforts to find this bird in various areas of the Rocky Mountains, without success. This time was different. The drive from Albuquerque to Sandia Crest was short, but the last 10 miles were a bit dodgey. The fog became quite dense and the winds were high, but on the other hand, there was virtually no traffic and the temperature stayed at 33 or above. So I arrived at Sandia Crest (altitude about 12,000 feet) about 9:00 a.m. and as I pulled into the parking lot, where there were no other vehicles, a flock of about 40 Rosy-finches was feeding on the edge of the lot. Most of them were Black Rosy-Finches, with a few Brown-capped Rosy-Finches mixed in. I did not see any Gray-crowned Rosy-Finches in the group, but the lighting was pretty grim with all the fog and wind and I could have missed them if they were there. I had no photographer with me to rely upon, so I tried to use my little point and shoot camera to get some pictures. They all failed miserably due to the fog and my ineptitude. 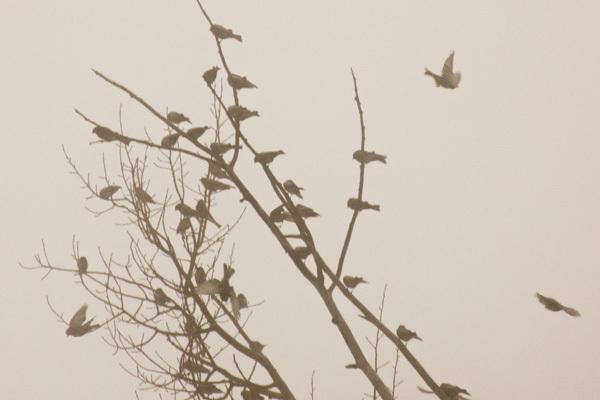 The best I could do was to get a “profile” of the flock of Black Rosy-Finches in a bare tree near the parking lot. I did get some good close-up views with my binoculars, so my identification is solid. Hurrah!!! Number 715 on my North American Life List, and (unless more splits occur) only 10 more Code-2s to find: Mottled Petrel, Whiskered Auklet, Bluethroat and McKay’s Bunting (all probably only to be seen in or near Alaska); the newly recognized species, Nanday Parakeet, Mangrove Cuckoo and Antillean Nighthawk (all probably only to be seen in Florida), Black Swifts (I have a line on a place to find them this spring in Colorado), Scripp’s Murrelet (until December, 2012 conspecific with Guadalupe Murrelet under the name Xantus’s Murrelet), off the coast of California, and the bane of my life, Sooty Grouse (formerly conspecific with Dusky Grouse under the name Blue Grouse), which I have searched for several times since it was split from the Sooty Grouse, but with no success. Any suggestions, anyone? 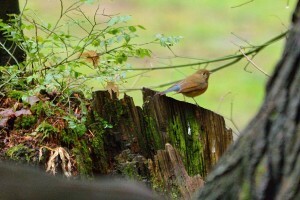 NARBA (North American Rare Bird Alert) has been reporting for quite a few days that a Code 4 Red-flanked Bluetail was being seen in Queen’s Park, New Westminster, British Columbia. I traveled there on January 25th and found my way to Queen’s Park. Several people with binoculars or big cameras were wandering about, quite obviously in search of the same bird that I had come to see. One of them, a local resident, Ken Kennedy, took me under his wing and guided me to the area where he had seen the bird on prior days. Sure enough, within minutes the little wanderer showed up and I was delighted to get views of him, making this my North American Bird # 714. Not only that, but along came a birder from Seattle, Hank Elliot, who took some great pictures of the Red-flanked Bluetail and he has allowed me to publish a couple of them on my blog. 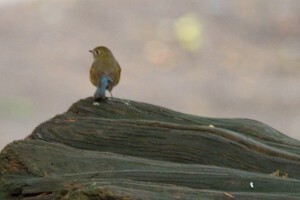 Primarily an Asian species, the Bluetail has been seen previously in the western Aleutians, but seldom, if ever, as far south and east as Vancouver. This one appears to be a young male, not quite as blue as an adult male, but showing more blue than the female of the species. I stayed overnight at Haddon House B & B in nearby Burnaby, which I highly recommend. Johannes, the proprietor, directed me to a wonderful neighborhood restaurant for dinner, Hart House, and it was delicious. I particularly recommend the Parsnip Soup Voloute. Not to be outdone in culinary prowess, the next morning Johannes prepared a bountiful breakfast spread including one of the nicest omelettes that I have demolished in a long time.